Ouch. 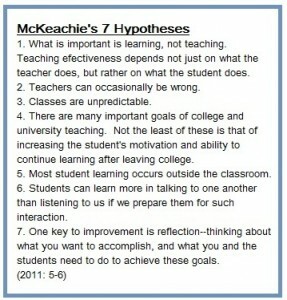 McKeachie goes on to say that the questioning methods advocated by a student of the Socratic method, Allen Collins, “may be generally useful in leading discussions,” but it seems as though McKeachie is rather lukewarm on the method. At first, I thought, wow, that’s a harsh statement about a teaching method that, in my experience, tends to be praised and emulated, not denigrated. And then I realized that it all depends on our sympathy with Socrates: do we believe him to be as ignorant and as truth-seeking as he claims, or do we believe that he has the answers and leads and pokes and gadflies his interlocutors to those answers? If we believe that Socrates is honestly working with his interlocutors to find answers to questions like “What is virtue?”, then I do think McKeachie is being unduly critical. However, if we believe that Socrates is disingenuously trying to show up his friends and discussants, then sure, it could be the case that the friends and discussants are pawnish. So how sympathetic we feel toward Socrates could then determine our own use of the method: if sympathetic, then use it; if not, then not. If we conceive of the discussion as a group working together to achieve understanding, then doesn’t the Socratic method seem worthwhile? After all, the reality of the modern teacher’s position is neither holding all the answers nor complete ignorance, it’s somewhere in between. I’ve learned that, even if I have read our classroom material only once, I can still lead us through a productive discussion together, simply because I’m a better reader—I’ve been in training for this for decades <flexes muscles>. And even in cases where I’ve read the material over and over, one of the most exciting things about teaching is that I learn new things all the time (admittedly, sometimes from rereading, but also sometimes from class discussions). McKeachie, like so many other theorists of pedagogy, discusses the importance of “active learning” (phrase used loosely here), and how the students need to be engaged—and how the deeper that we take knowledge in and internalize it, the better we understand and retain it (cf. Chapter 20, “Teaching students how to be become more strategic and self-regulated learners”). And is there a better way to engage students than by discussion? That’s a sincere question—like I said, I don’t hold all the answers. I am sure that if you teach econ or biology students at a large university, the press of time and numbers will require that you give classes in large lecture halls where large-group discussion may be impossible. But even in cases of large science or lecture classes, according to Eric Mazur, author of Peer Instruction, having the students talk amongst themselves will help them to achieve a more thorough understanding of the concepts. Discussion seems integral to the learning process there, too, even if it’s in a different setting. So if we can agree that discussion will help to deepen understanding (not to mention help develop certain skills like argumentation and communication), then what is it about the Socratic method that has caused McKeachie’s ambivalence? I think perhaps the answer lies in classroom experiences where the students perhaps do not realize that the professor doesn’t in fact hold all the answers, or where the professor doesn’t view the discussion as a group project dedicated to coming to a common (and thorough) understanding of the material. We’ve probably all had the sort of professor who asks questions with a particular answer in mind. The students hunt around for the answer, and the brave ones will say it, either because they’re sure or because their skin is thick enough to take it when the professor shoots their answer (or them!) down. That scenario seems to be a very poor application of a pseudo-Socratic method to me (but then, I’m sympathetic with Socrates). In that case, the professor is maybe disingenuously leading his students to a particular idea. So, perhaps the answer lies in the sincere use of the Socratic method? That it’s a matter of the professor’s approach being characterized by a willingness to not only be wrong, but to admit the limits of his or her knowledge and attack the reading alongside the students, working together, rather than from on high? Socrates would be the first to admit the importance of knowing the limits of our knowledge. I’m not advocating egalitarianism in teaching, exactly; order, discipline, hierarchy have a certain place in the classroom. But I suspect that a sincere questioning that comes from an acknowledged place of semi-knowledge and semi-ignorance will generate more productive discussion than a Q & A session that tests a student’s ability to understand his or her professor and the questions. Know and be ready to admit your limits—i.e. be humble enough to work together. I don’t think McKeachie would be ambivalent about this lesson; I think he’d support it. And perhaps he would not be ambivalent about a thoughtful application of the Socratic method stemming from a sympathetic understanding of Socrates. Collins, A. (1977) Processes in acquiring knowledge. In R. C. Anderson, R. J. Spiro, and W. E. Montague (eds. ), Schooling and the acquisition of knowledge (pp. 339-363). Erlbaum: Hillsdale, NJ. Mazur, E. (1997) Peer instruction: a user’s manual. Prentice Hall: Upper Saddle River, NJ. Svinicki, M. and W. McKeachie (2011) McKeachie’s teaching tips: strategies, research, and theory for college and university teachers. Wadsworth Cengage: Belmont, CA.